I have been making and selling tiny dolls, toys and teddies for the dollshouse nursery for nearly thirty years. From a very young age I was fascinated by miniatures, loved teddy bears and enjoyed crafts. When I was a child (in the 1960's) my favourite exhibit in the town museum in Worthing, West Sussex was a pedlar doll about 12 inches high with a head made from a preserved apple and in her tray she had tiny sewing items. It was always in the back of my mind to try and make one. Many years later I did make a pedlar using the traditional wooden peg doll method. This meant my doll was about 6inches tall (half the size of the one in the museum). I wanted a tiny wooden doll to put in the tray so I created the wooden doll pictured. I still sell these today. Another item of inspiration when I was young was a very tiny orange pipecleaner teddy inside a craft kit which came in my Christmas stocking. The instructions in the kit showed you how to make very simple animals out of pipecleaners but not how to make the teddy bear. I remember my mum, dad and older brother all trying to make one for me but with no success. Again, it was many years later I started fiddling with a packet of coloured pipecleaners from a tobacconist and managed to create an acceptable 3/4 inch tall bear. After many years of hunting for suitable pipecleaners in quality and colour it was a relief in 1992 to discover the british manufacturers Hewitt and Booth in Huddersfield. Some of my original range in 1985. In October 1985 I booked a very small stand at the a doll fair held at the Metropole Hotel in Brighton by the Global Doll Society. 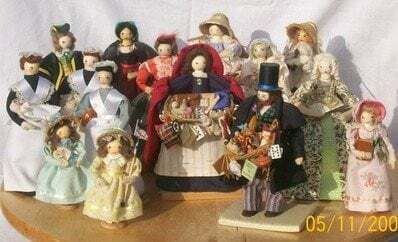 I had a variety of dressed peg dolls similar to those pictured on the right including the pedlar. I also took 40 pipecleaner teddies and 5 tiny wooden dolls. I sold a few peg dolls but I was more successful selling all of the tiny teddies and the little wooden dolls. Ann Strudwick, a trader with a shop in Hastings called Children's Treasures, bought some of the teddies and wooden dolls and asked me to supply her by mail order. This encouraged me to work out some other tiny dolls and toys which was the start of my early range of miniatures and my first mail order was sent out in April 1986. Around the same time I met Kristin Baybars at a dollshouse fair in Portsmouth. Kristin has a long established toy and dollshouse shop in London and I have supplied her with many dolls over the years. 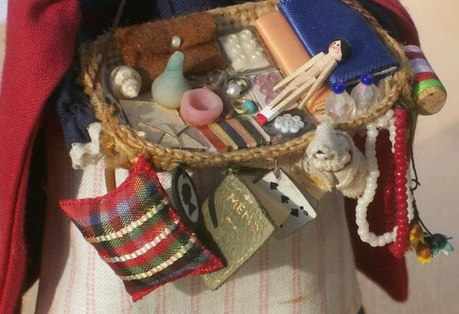 Close-up view of Pedlar's Tray showing one of my original wooden dolls. I left work at a bank to start a family in 1992 and now have three girls aged 21,19 and 15. From 1991, as more time became available, I started to increase my range and exhibited annually at the original Hove miniatures fair and Alexandra Palace fair both organised by Marion Fancey (the first Editor of Dollshouse and Miniature Scene). Later we also did fairs at Excel run by Dollshouse World Magazine.When my third daughter started school in 2003 I was able to turn the miniature making from a paying hobby into a small business. I now exhibit regularly at the Kensington Dollshouse Festival in May and December and Miniatura March and September. The pedlar doll I now make is one inch high and at present I am working on developing a range of 1/48th period dolls so I am really back to making the dressed peg dolls only a lot smaller! Luckily I have a very supportive husband who accompanies me to the fairs and who has designed, built and adapted my stand over the years as my range of miniatures has grown.